BSH Lower engine mount for your 2007+ R55, R56, R57 R58 R59 Cooper and Cooper S. If you want to make your engine rock less. This is a direct replacement lower engine mount that will firm up the engine and transmission. This mount completely replaces the stock MINI lower engine mount. Made from T-6061 machined aluminum and filled solid with polyurethane. This harder BSH lower engine mount will transmit more vibration to the cabin. Just part of the trade off of stiffening up your engine. The race version throws be back in my seat from 3500 RPM to redline. Very cool and easy to install. 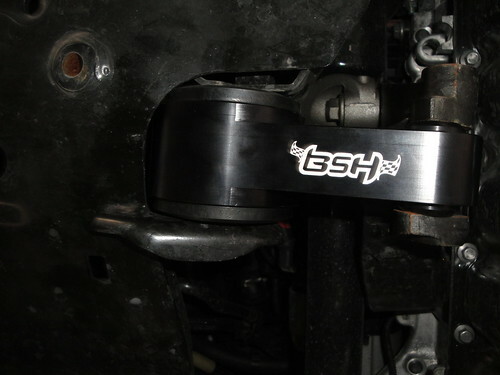 BSH made a quality and affordable part with this one! Installed the street version and went out for a drive. Can't wait until the mount is fully broken in but it's a quality part and transforms the car! Installed street version. Expect a little vibration when grabbing first for the first time. Vibration smooths out with higher RPM. Very smooth on the high way and even in non sport mode the vehicle overall feels stronger. Everything feels more direct, no delay felt after stepping on the accelerator. Shifting seems smooter and greatly improved, no more hunting for gates. As for cabin vibration its almost like getting a mild exhaust upgrade, improved interior sound. Overall you feel more connected to the vehicle. I really like it. Enjoyed the way it changed the car but had to take it out due to passenger complaints. Lots of additional noise and vibration. Just installed on my 09 Factory JCW. Pros- really connects the driver to the machine, excellent shifting improvement, syncs the engine to the car for a more efficient power transfer. Cons- MAJOR vibration (settles in time), increased interior noise. If you're serious about performance, then it's a must have.